Charcuterie is a French branch of food preparation dedicated to cured meats that is generally served on a board with an assortment of cheeses and condiments. Now I'm a big fan of any dish that allows for different flavors and textures to be mixed and matched at will, so I've always loved food served with this style. However, I recently realized, that for some unknown reason we have culturally constructed the rule that this unique taste-segregating method of food preparation be strictly reserved for lunch and dinner -hopelessly damning the components of our breakfast plates to mindless mixes of "scrambles" and "skillets." Alright...I'm being negatively dramatic, of course I love eggs fried with random things as much as anyone. Anyway it was this epiphany that inspired me to spend a Sunday morning crafting my own tray of all my favorite breakfast flavors that could be perfectly mixed and matched at the will of my taste buds. I eat a lot of salmon pâtè for a simple reason- I love salmon. More specifically, I love salmon as an on-the-go protein packed option. For example, when I'm traveling one of my go-to meals is to simply stop by a grocery store and grab a pack of smoked salmon and an avocado: quick, easy, protein packed, and about the same price as fast food. With that being said, smoked salmon is significantly more expensive than canned salmon, so when I'm home -and don't have time to cook a fresh fillet- I just toss a can of wild-caught pink fish in my food processor with some olive oil, balsamic, and spices-of-the-moment... and voilà! Delicious salmon pâtè. In most cases I just eat it as-is from a bowl, but if you want to form a cool shape (to help make awesome photos) just line a container of choice with wax paper, press it in, and let chill in the fridge for an hour or so. Similar to a pâtè, a terrine simply implies more coarsely chopped -or in this case blended- ingredients. For this I simply cooked some quality* bacon in my cast iron pan until there was a good amount of fat released, at which point I added some chopped shiitake mushrooms. After the mushrooms got soft, I deglazed -fancy word for adding a liquid to help remove stuck pieces from the pan- with some brandy. I then let the alcohol burn off and added the contents to my food processor. To get it to take shape, just line the container of your choosing with wax paper, pack it in, and let chill in the fridge for an hour-ish. *Let me take a second to explain my take on bacon... I so often have people say, "You eat bacon? You cook food in bacon fat? I thought you ate healthy?" The truth of the matter is that I have no problem with pork, bacon, or cooking with lard -IF it's from a quality pig/farm. I strongly believe that nearly all food products if responsibly cultivated, properly prepared, and moderately consumed can be part of a healthy diet -and that no foods are inherently bad or unhealthy. I simply refuse to make blanket assumptions bastardizing all gluten, dairy, or bacon. With that being said, I am more then eager to talk your ear off about the nutritionally detrimental practices of un-soured white bread, pasteurized milk, and nitrate loaded bacon from concentrated animal feeding operations. Point is, when I am able to get my hands on pig from a local farmer who I trust, I take it as an opportunity to celebrate the umami-bomb awesomeness that is bacon. I decided that none of the classic egg preparation methods really did a charcuterie tray justice, so I came up with the idea to create "egg rounds" that can be stacked on bread, or smeared with pâtè. They worked surprisingly well and would be extremely open to ingredient substitutions and add-ins. All I did was beat a few eggs with a dash of salt and a couple drops of liquid smoke -no real smoke, I know, I'm a phony- then poured the mix into just the bottom of an oiled muffin pan and baked at 375 for 10min-ish. Not exactly a classic breakfast condiment, but I hate to engage in any culinary adventure and not include my beloved pickled beets. For this I chopped up a jalapeno, sweet pepper, and a few beets, then tossed the mix in crème fraîche (French style sour cream). The perfect way to add some beautiful color and a pro-biotic kick, plus it's delicious! What's a board full of mouth watering spreadables without the perfect vessel to carry the flavors? Just a few slices of my fresh baked sourdough bread, brushed with butter, and tossed on the grill. My breakfast spin off of this traditional Spanish tapa features apples, walnuts, and olives tossed in maple syrup and warmed in the oven. Don't let the confusing mix of flavors deter you -I was skeptical at first too- the saltiness of the olives is perfectly complimented by the maple-apple sweetness, with the walnut crunch bringing the whole thing together. Super easy way to add some life to that boring jar of olives you keep in the back of the fridge, highly recommended! I'm the kind of guy who likes a little 'kraut with just about everything, but in this case I decided that it would be more aesthetically pleasing to mix it in with some freshly smashed avocado instead of just putting a heaping pile on the center of the board. The sourness of the 'kraut does a good job replacing the lime juice that is generally used in guacamole, and the pickled cabbage shreds add a pleasing crunch. Plus, it's the perfect way for people who don't like eating 'kraut by the fork-full to get their live culture pro-biotic bacteria fix! 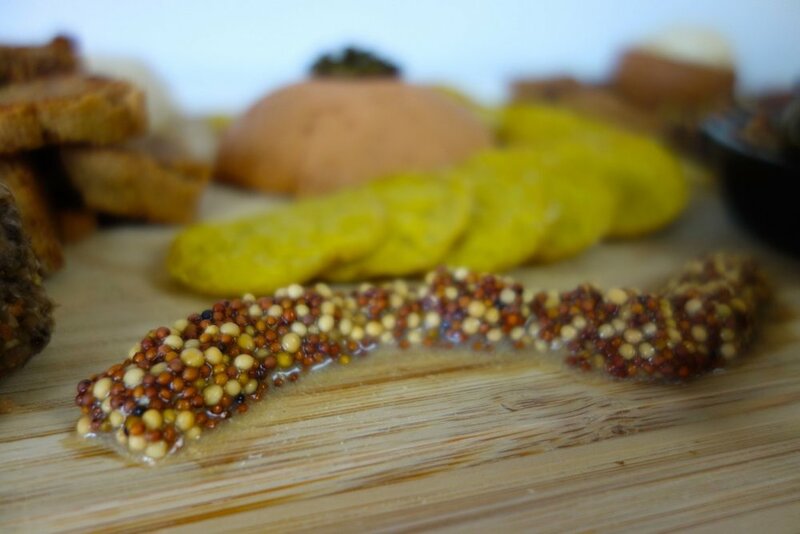 This is a super easy way to make your own fancy-looking mustard, and is a great way to use your home brewed kombucha that may have gotten a little vinegar taste from being fermented to long. Just mix mustard seeds and kombucha in a jar, cover with a cloth and let sit at room temperature -anywhere from a day to a couple weeks. The seeds will absorb the liquid, so be sure keep them submerged, adding more kombucha as needed. After this, you can serve as they are, or blend them to make a more traditional mustard spread. In case you haven't heard me romanticize the mind-blowing nut-transformation of cashew cheese, let me briefly explain. Take some raw cashews (the regular boring kind that you can't give away and are often mistaken for peanuts), soak them in water overnight, drain the water, blend them up, and BOOM! By some act of unknown culinary mysticism the nuts are transformed into a rich and creamy spread that can be flavored either sweet (think cheese cake) or savory (think dips or spreads) -in this case I used a few cloves of roasted garlic and some truffle oil. The mix can be hardened by hanging in a cheese cloth to drain the liquid, fermented by blending in some pickle juice (see this post), OR, in this case, pressed into a wax paper lined bowl and hardened into a ball in the fridge. We all love honey, and we all fantasize about bathing in goat cheese -so I'm not going to spend to much time jabbing about how unbelievably delcious-to-the-point-that-you-consider-licking-it-so-you-don't-have-to-share this combination is, but I promise it's well worth your time to whip these two ingredients together and experience the synergistic taste for yourself. In this particular case, I turned the level up a notch by serving this creation in a pear -that I simply cut in half, scooped out a bowl, rubbed with butter, and roasted at 400f until brown. Although I am more than willing to eat the aforementioned divine cheesy creation by the spoonful, I decided it would be more socially acceptable to have something crisp to spread it on. So I soaked a cup of oats in water overnight, drained the liquid, mixed in a couple spoonfuls of yogurt, spread it thinly on a silicone baking mat, and let it crisp up in the oven at 375f. Along with these breakfast crackers, I added an assortment of banana chips, chopped figs, and roasted pistachios.